Collecting is a hobby many of us have drilled into us from childhood. We’re led to believe that not only is it fun, but if we wait around long enough, is likely to reap some hefty financial rewards. However, while finding a personal number plate spelling an interesting sequence may be well-worth the time and effort, our capitalist world is ridden with ‘collectibles’ that are anything but. Here are three ‘collectibles’ that will do nothing except collect and carry away your time and money. These ‘collectable’ animal shaped bean bags were all the rage in the mid-nineties, and still today people buy them not for their most obvious purpose, as a toy, but to collect, in the belief that they will someday become highly valuable. However, people’s beliefs that these modest $5 purchases could later be sold for $40 or $50 have proven (apart from a few solitary exceptions) to be completely unfounded. 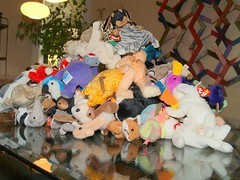 Instead, most owners of Beanie Babies would be lucky recoup a couple of dollars of their original purchase price. American artist Thomas Kinkade has succeeded in trademarking himself with two titles: the ‘Painter of Light’ and ‘America’s most collected living artist’. The clue is in the second title; anything that is the ‘most collected’ is unlikely to be that collectable at all. Initially, Kinkade’s colourful works of art were valued quite highly. Yet sadly, Kinkade’s greed set in and his pieces became victim to commercial suicide; the final moment of death occurring when he decided QVC stood as a viable house for selling art. The maker of these adorable wide-eyed figurines deserves a firm pat on the back. Their ingenious design and marketing has made these ‘precious’ figures so sought after that they are now largely worthless – and yet people still buy them. 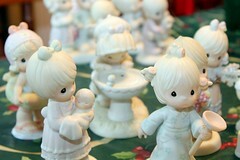 Retailing at $45, most of the Precious Moments range can today be picked up on eBay for between 99 cents and a hefty $5 – a substantial loss in and of itself. Yet ‘true’ Precious Moments collectors can shell out an extra thirty something dollars a year to become a privileged member of the ‘Collector’s Club’ with such exclusive benefits as access to members only figurines, a ‘member’s kit’ and even a ‘free’ yet not at all exclusive figurine. And things that are worth collecting? The truth is, it’s very difficult to predict what will become valuable and what won’t. However, as a general rule, anything marketed as a collectable (as above) is likely to become anything but. For instance, the first ever Barbie doll, launched in 1959, now fetches around $8,000 – something no-one could have predicted at the time of her launch. Your best bet is to choose items that are entirely unique; car registration plates are a good bet as are one-of-a-kind movie props (if you can find them). You might even do well to pick up a limited edition item from a well-known collectors range (despite the criticism above there are a few Beanie Babies and Precious Moments statuettes with a significant value attached) – however, be sure to find out how ‘limited edition’ these items are. If they release five you might be onto a winner. However, there’s no real conclusion to what ‘limited’ is; it could mean 5,000. If so, stay well clear. Article written by Amy Fowler on behalf of The Plate Market, suppliers of personal number plates and car registration plates. Photos by Michael Lehet, Bobosh T and Matthew Reid. I have to admit, when I first read “Amy Fowler,” I thought you were talking about Amy Farrah Fowler” from Big Bang Theory. But I digress. Great post. Informative. I don’t think I have ever, in my life, owned any of the items listed above. Thank god. I wouldn’t want to. I do remember the explosion, however, of all three, especially the Beanie Babies. Jeez, they were everywhere. 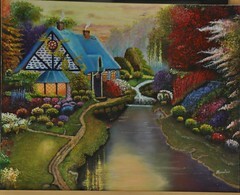 And Thomas Kincaid? How do you sell that kind of stuff on QVC? Is he pumping them out himself?? He’s still probably sitting at home, counting all of his money, though. Thanks for the comment Sean! I’m sure Amy appreciates the good feedback :). People go through the craziest phases, I guess. Here in Denmark it was yo-yos, scooters, Poker, you name it! And indeed, as long as there are people buying his stuff, I’m sure Thomas is doing just fine!